The first T in TFTP stands for trivial; TFTP is unreliable and error-prone and won’t work over wide area networks. Ideally, PXE systems would implement alternative protocols but most don’t. Configuration files for PXELINUX (i.e. the things that live in its pxelinux.cfg directory) cannot be created on demand. I can pre-create a file and save it in the required directory for TFTP to send out, but files must exist by the time PXELINUX asks for them. Earlier this year I mentioned I was setting up lots of bare metal, and I mentioned iPXE (formerly gPXE, formerly Etherboot). iPXE is a network boot loader which provides a full PXE implementation with some exciting features: it can boot via HTTP (and from an iSCSI SAN), and I can control the boot process with a script. Ideally, the network cards (NIC) we use would have iPXE burnt in (which can be done) but in this project we haven’t yet evaluated what that would mean in terms of hardware. In the following discussion I assume you’ve downloaded a copy of the iPXE source code and that you’ve have unpacked that and run a make in the src directory. This first make takes a bit of time; it creates all of iPXE’s target formats. Later on I’ll show you how to embed a script, and the make for that takes a second or two. 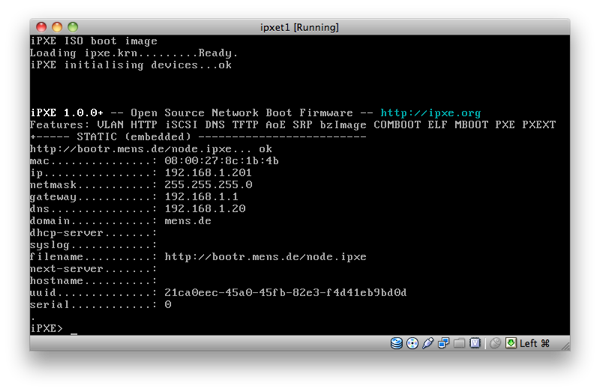 machine2 boots with a customized iPXE script, either from a modified network ROM or via, say, a CD-ROM. It obtains its network address via DHCP and can then directly “speak” to a HTTP server. To create a customized boot loader with an embedded script (e.g. jpmens.ipxe), I invoke make bin/undionly.kpxe EMBED=jpmens.ipxe and store the resulting file on a bootable floppy or burn it onto a CD-ROM, etc. The embedded script uses a iPXE commands to obtain DHCP parameters when it starts, or I can hard-code IP address, net mask, etc., and I can use iPXE settings in the script, as we’ll see for machine3. In the case of machine3, I’ve created a custom iPXE image with which the machine boots. The script contains hard-coded network addresses, and it should be straight-forward to mass-create custom images with a bit of sh and make. This is interesting if there is no DHCP server (or relay) close to (network-wise) the node. When the machine (node) boots it fires off its first PXE request, our DHCP server receives the request and gives it an IP address, netmask, etc. as well as a boot filename undionly.kpxe. The node then retrieves undionly.kpxe via TFTP and loads and executes it. iPXE (undionly.kpxe) then again issues a DHCP request. Without the if exists user-class magic we’d enter an endless loop where iPXE would load itself, then load itself, ad nauseam. The if ensures that when iPXE issues a DHCP request, it is given the filename called netboot.php which resides on a HTTP server. From this point onwards, everything happens over HTTP! The echo prints information to the screen, using some of iPXE’s settings. Apart from that, a kernel is loaded together with an initrd image, and we attempt to boot that. If that fails, we fall back into iPXE’s shell. The file jpstatic.ipxe is an iPXE script which defines network addresses for the machine and subsequently chains to the boot file. 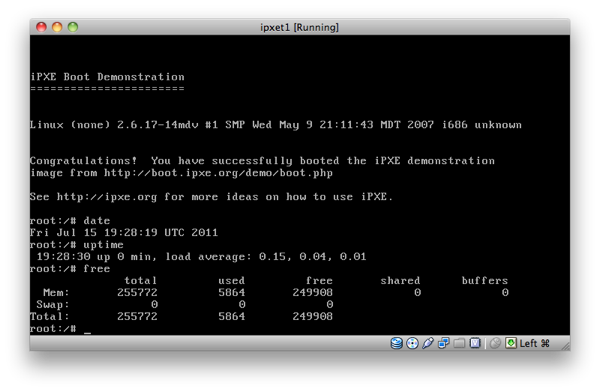 When I launch the virtual machine, it boots from the ISO image containing iPXE. 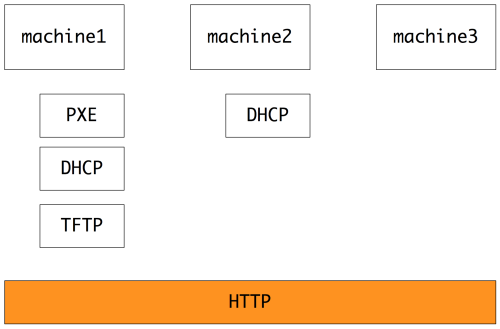 iPXE initializes its network stack and proceeds to run the embedded script. Note how the chain command loads a script or image from the specified HTTP server and then boots into that. GET /pxe/pxelinux.0 HTTP/1.1" 200 26582 "-" "iPXE/1.0.0+"
GET /pxe/pxelinux.cfg/421a7b8d-c336-ce6f-8dcc-5178ff8b8c7e HTTP/1.1" 404 328 "-" "iPXE/1.0.0+"
GET /pxe/pxelinux.cfg/01-00-50-56-9a-00-1d HTTP/1.1" 404 312 "-" "iPXE/1.0.0+"
GET /pxe/pxelinux.cfg/0A000CFB HTTP/1.1" 404 300 "-" "iPXE/1.0.0+"
GET /pxe/pxelinux.cfg/0A000CF HTTP/1.1" 404 300 "-" "iPXE/1.0.0+"
GET /pxe/pxelinux.cfg/0A000C HTTP/1.1" 404 300 "-" "iPXE/1.0.0+"
GET /pxe/pxelinux.cfg/0A000 HTTP/1.1" 404 300 "-" "iPXE/1.0.0+"
GET /pxe/pxelinux.cfg/0A00 HTTP/1.1" 404 300 "-" "iPXE/1.0.0+"
GET /pxe/pxelinux.cfg/0A0 HTTP/1.1" 404 300 "-" "iPXE/1.0.0+"
GET /pxe/pxelinux.cfg/0A HTTP/1.1" 404 300 "-" "iPXE/1.0.0+"
GET /pxe/pxelinux.cfg/0 HTTP/1.1" 404 300 "-" "iPXE/1.0.0+"
GET /pxe/pxelinux.cfg/default HTTP/1.1" 404 300 "-" "iPXE/1.0.0+"
# Set the root directory for files availble via TFTP. If configured to use local boot media, loads iPXE from that. Hardware does a PXE boot and sends out a DHCP request. DHCP server returns reply and boot filename undionly.kpxe. Node requests file from TFTP server. chains (boots) into the script returned by netboot.php. Node loads pxelinux.0 via HTTP. pxelinux.0 loads further kernel via HTTP depending on configuration. Nodes can boot over the WAN links (e.g. the Internet). If necessary, we can use caching HTTP proxies to reduce the volume of data transferred from the deployment server to groups of nodes. We can apply granular access-controls to the HTTP server, something very difficult (or impossible?) to do with TFTP. We are highly flexible in how we create configuration for clients; we can use database queries to provision boot scripts to individual nodes or groups of nodes. Client nodes can be set to always PXE boot, and we can remote-control what they do when they’re power-cycled: install, boot from disk, show menu, etc.